By Samar Owais in Blogging. Updated on April 7, 2018 . Every blogger I’ve known (including myself) has googled ‘How to grow a blog’ one time or another. Soon after the first post is published, you start thinking about getting traffic and comments, more precisely what you need to do in order to increase both. One of the first things a blogger does, when faced with the dilemma of growing his or her blog is research. As you search, you realize that you keep coming across the same advice over and over again – from A-listers and normal bloggers alike. If so many people are vouching for the same piece of advice, then it must surely work, right? So you spend the next few months trying one advice after another, hoping it’ll take your blog to greater heights. You’re doing everything that they say will work; the problem is, they don’t! Here’s what won’t work and how you can make it work for you. This was the first blogging advice I took to heart – and failed spectacularly at. Blogging every day is an open invitation to a blogging burn-out. Not only do you run out of things to say but your writing suffers too because you can’t spend as much time proofreading, editing and polishing every post. To top it all off, your blog post’s life span is reduced to a single day. That’s not enough time for it to gain traction in social media or get comments. You don’t get any time to market it! Blogging every day sounds good in theory, but in reality, it squeezes the life and creativity out of you. Unless your blog is your business, there’s a good chance new blog posts every day isn’t what your blog needs. Change your goal of blogging every day to blogging regularly. Decide on your blog’s needs. How many posts a week do you really need to attract visitors and keep your blog active? New blogs tend to do well with 2-3 posts per week. Experiment with posting schedules to see which days get most visits, comments and interaction and target your publications within that optimum space. The second piece of blogging advice that you still find famous bloggers imparting proved to be a bit of an oxymoron for me. How could I write great content if I had to blog every day? If you’re blogging every day, your content is going to suffer. Great content takes time to write. It starts with a killer headline and ends with a powerful call to action. Throw in the content that needs to go between the two, and a mini-quest for the perfect images, and you’re looking at a LOT of time and energy devoted to creating great blog content. Writing great content takes planning. Great content not only imparts knowledge but it solves your readers’ problems. It gives them viable solutions. Take some time to go through your blog analytics. What are the people who are landing on your blog searching for? What answers are they looking for? I’ve found that the posts I write based on conclusions from my search analytics are the ones that remain evergreen and keep the traffic flowing in. That seems to be the advice for anyone looking to make a big splash with their blog. Everyone’s writing the same old stuff so they say be different, take an opposing view, and don’t be afraid to offend a few people. What it really does is make a fool out of you. Instead of convincing readers of your point of view, controversial posts force them to take sides. What happens if you can’t defend your controversial view and some commentator comes in and convinces readers that you’re wrong? 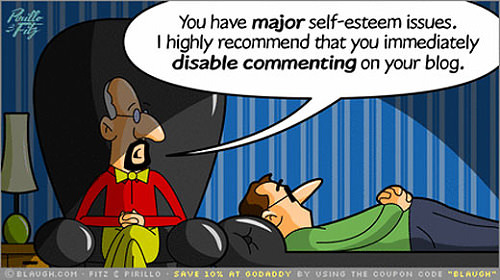 Only write a truly controversial post if you’re confident you can defend your point of view. Instead of writing a loud, controversial post, pick an angle that hasn’t been covered. 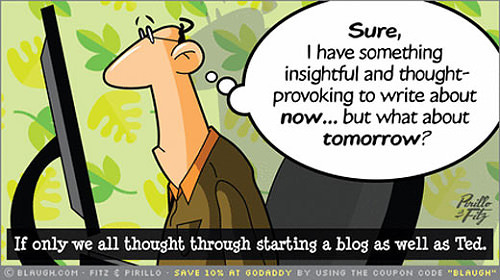 Let’s say you have a freelancing blog. Every other freelancing blog out there is telling you not to work for low rates. No matter what the gurus say or how solid that advice is, freelancers still offer low rates in the beginning. So instead of trying to convince them not to do so, write a blog post about factors to consider when accepting a low-paying client. If you want to make your blog visible, comment on as many blogs as possible – that’s the general consensus. It allows you to leave your footprints all over the blogosphere which trails back to your own blog. While that was true a few years ago, it’s not anymore. Blog commenters have gotten busier. They no longer have the time to go over to your website after reading your comments. Most of the time, commenters don’t even read other comments! They leave a comment and get out. No one is saying you shouldn’t leave comments. They are a very important part of your blog-growing strategy. However, comment on relevant blogs and posts, and then monitor which blog is sending you the most traffic. I still get visitors from a blog I commented in 6 months ago. Here’s a tip: to increase visibility for your comment and your blog, sign your comment with your name and your blog’s name, for e.g. Samar @ myblog.com. This way when people see your comments, they’ll know which blog you’re from. I fell for this advice hard – and swore off holding a competition on my blog for a long time afterwards. The fact that you need to grow your blog means you won’t be getting enough traffic to make the competition successful. Besides, competitions require effort on the reader’s part. They won’t make the effort if they don’t know or trust you. Instead of holding a competition with a prize at the end, do a give-away instead. Social media is the best way to raise awareness these days, so ask for a simple tweet in exchange. If it’s a free report or a product of your own making, you can also give it away to everyone who tweets or shares it on social media. Create a social share page where they’d be taken to the info product after they share the page on social media. The problem with popular advice is that it’s generic. No two blogs can follow the same advice and get the same results. A lot depends on the blog content and blogger in question. So take the time to understand your blog and business needs before applying any of the advice you hear about blogging. Keep experimenting and tweaking until you find a combination that works. Have you followed some popular blogging advice only to find that it didn’t work for you?